Lately I have a bit abandoned the blog, and this is because starting a business is getting more complicated than it seemed at first. Just with bureaucratic tasks, thinking and designing new products and finding materials my time evaporates. And it is true that with this kind of job you are immersed 24 hours a day, nothing that from 8 am to 3 pm. But the desire and enthusiasm make up for it. Today I want to tell you I have proposed to make an entry every week and tell you a bit what I have in my hands or show you what is going out of the workshop, and of my head! You already know that I like to elaborate highly customized craft products, because they have a special magic that does not offer the ones made in series. One day I thought it would be good to offer mini-quilts (cloth panels) to hang on the wall with a name. The name of a newly-born on his crib, a name on the door of the room, etc. 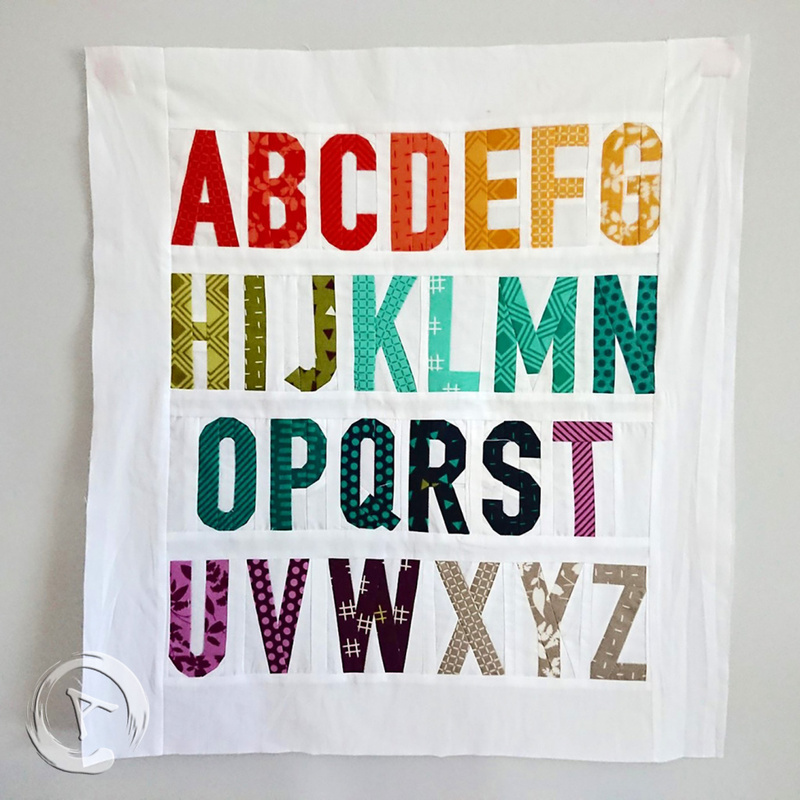 To make these names, there are several ways to do it, and one of them would be the “foundation paper piecing” (the other one will be the “appliqué”, as I made the pillows for the school of my children ). 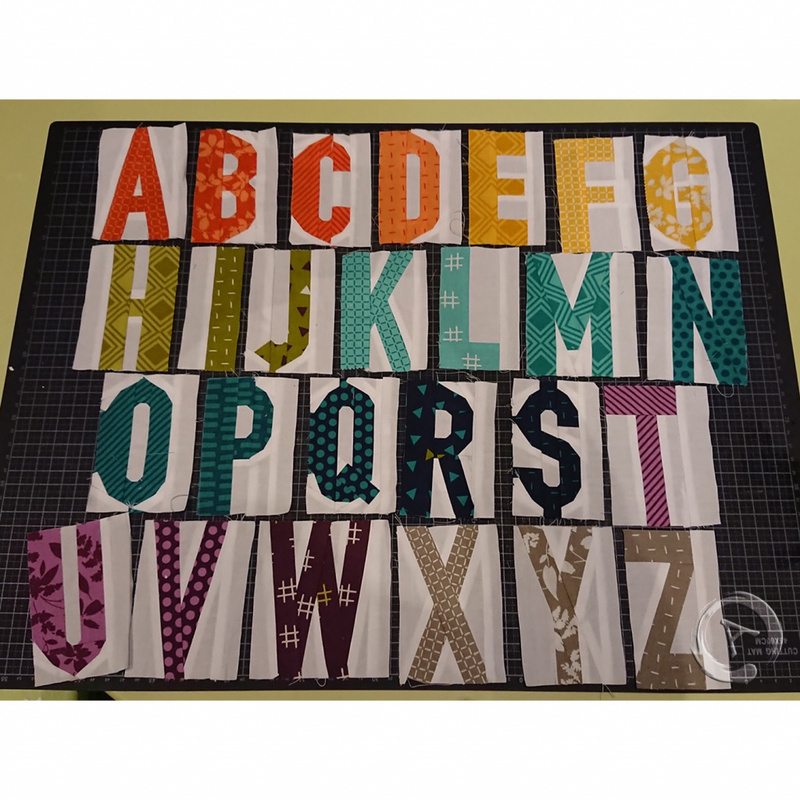 There are some paper piecing patterns available on the market, all with English letters only, but since I like to do everything original and the need of more letters in Catalan and Spanish than the alphabet English, I thought of doing myself this pattern so I could also offer it in case anyone would love to sew it yourself. Some months ago I started to work and started the pattern. 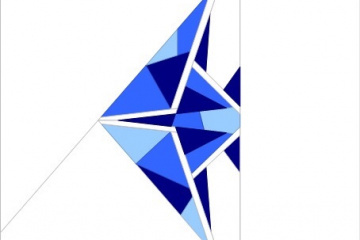 I wanted it to be a modern pattern and that it would feet well in any environment. 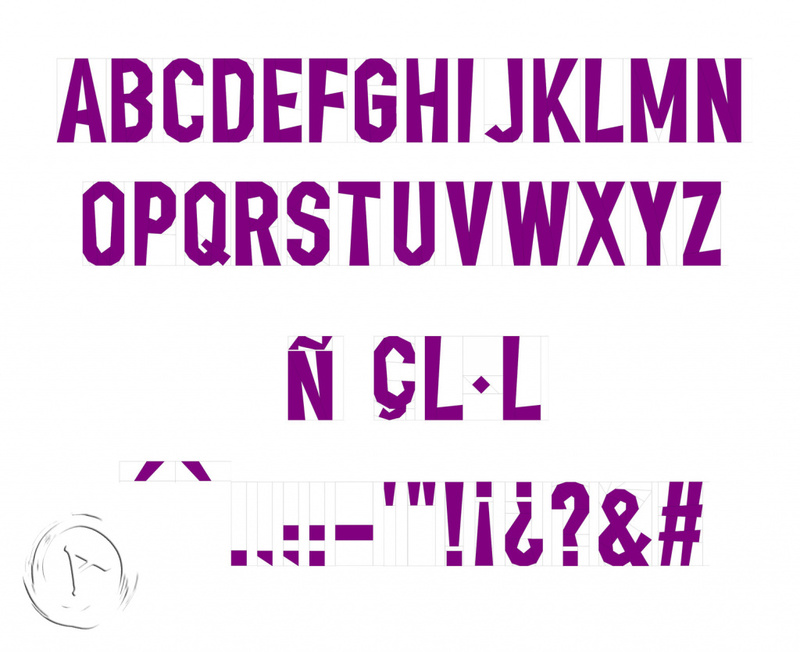 I chose the DIN Condensed font, at a size of 9 centimeters (3,5″) (for the letters to be hang in a door and the name is long). I extracted the images with a drawing program and passed to the pattern-making program I went one by one to make the necessary composition to obtain a pattern as easily and comprehensible as possible. The result has been 29 letters, two accents marks and 14 signs (with which we have the English, Spanish and Catalan alphabets). 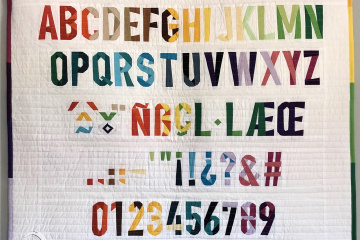 Here is the diagram of the letters with the pattern and the stitched letters (with rainbow colors fabrics, that my 5-year-old daughter chose the order). After having finished sewing all the letters I thought of making a panel with the English letters for people from outside, and make apart the other letters and signs … and I would like not to have this idea because an american designer started saying that I had copied the pattern … after all the effort of thinking how to do what was behind. I have tried to talk with her to see if we can clarify it but she does not answer … and what am I doing now with this pattern? For now, wait to see if it is worthy to tell me something. The resulting panel is this one. 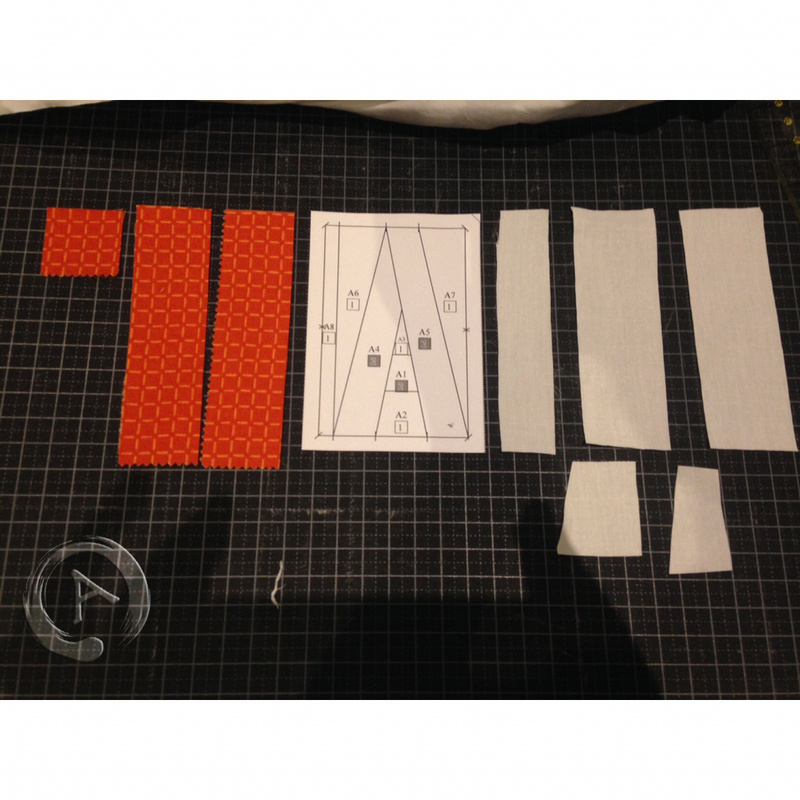 But it is already unsewed and in process of being assembled differently. 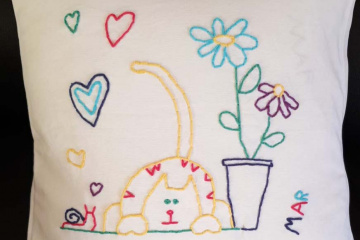 I want to show you also a pillow that has made one of the “Cosidores de Mallorca” (new group that has been created in Instagram for lovers of sewing residents in Mallorca, of which I will talk to you another day), @la_caja_de_angela. 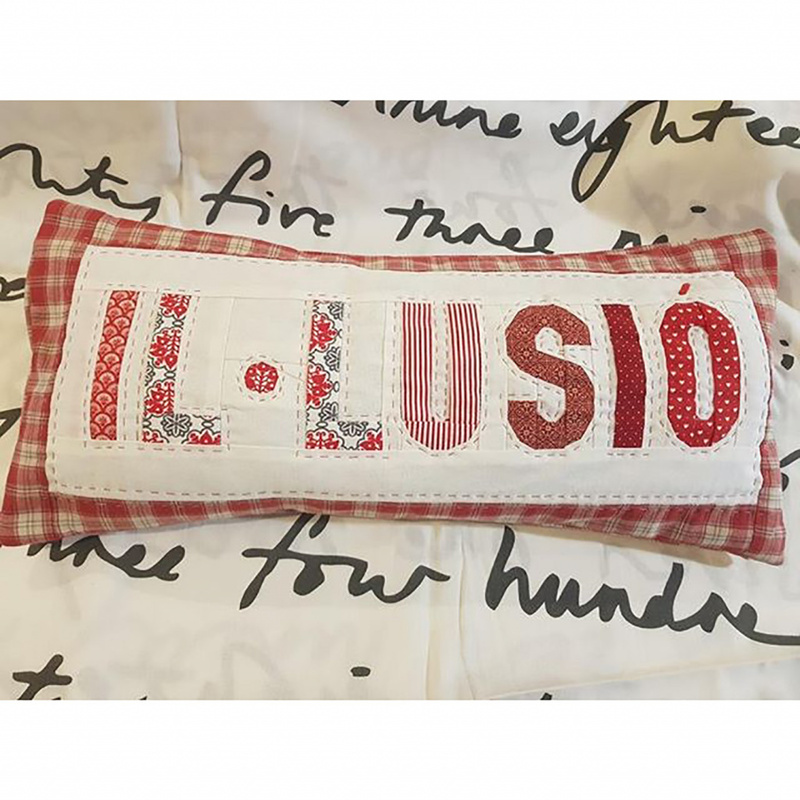 She choose the word “IL·LUSIÓ”, with some red and white colors and a handquilted that I love! You can see the versatility of these letters, everything can be done. And for now, I have decided to try to redo the pattern of these letters, without any source of reference and looking for a totally different style. Here is the result, much more asymmetric than the previous one. Now it will be worth trying to sew them. I already have a couple of people interested in doing the tests. When I start having results, I’ll show you. Which of the two Alphabets do you like more? Would you like to learn this technique and customize your creations? Thank you very much for reading me and see you soon!